Have you ever made a risotto? I mean a REAL risotto, not a cooked rice salad! 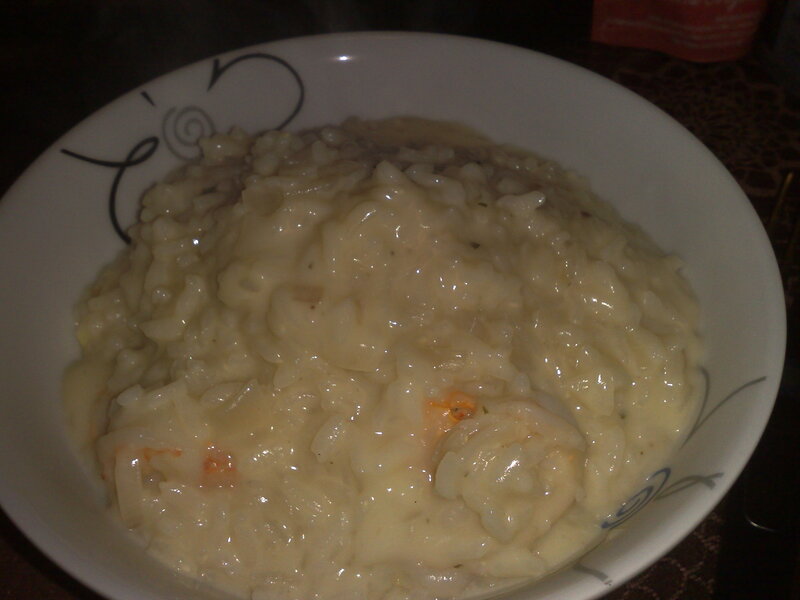 It is the epitome of comforting food and it takes more patience and elbow work than skill.I made mine with prawns, but as long as you get the basic risotto right, then you can pretty much add anything you fancy by putting it in early enough for it to cook or cooking it separately and adding it in the last few minutes. The following feeds two very hungry people. Don’t try to make this risotto quickly. It needs love and patience and constant attention. Fry the onion and garlic in the olive oil for a few minutes until they just start to brown. 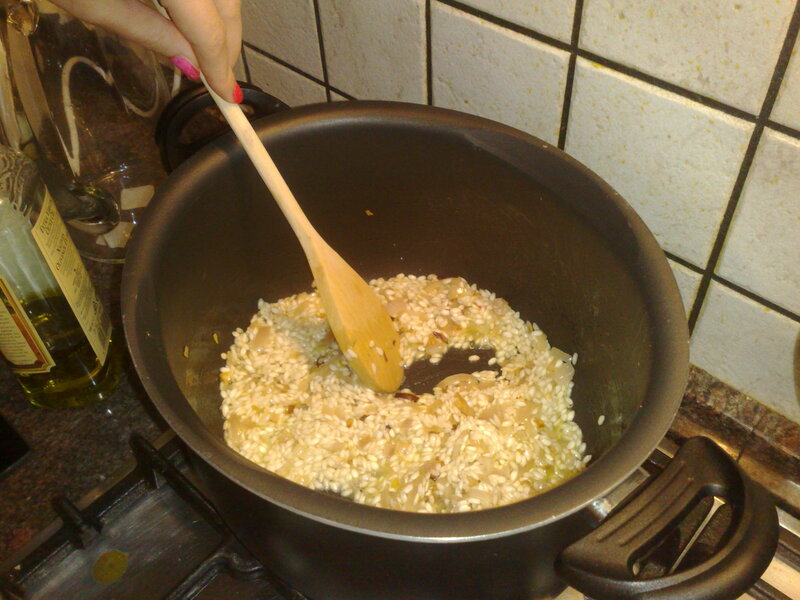 Add the (dry) rice and continue frying for a few minutes until the rice is coated in the mixture. Stir continuously. Add half a glass of wine and continue stirring until almost all the wine is absorbed. Continue adding the rest of the wine a half cup at a time, every time waiting till all the liquid gets absorbed before adding more. When you’ve used 2 cups of wine, pour yourself a glass as a reward for your patience. 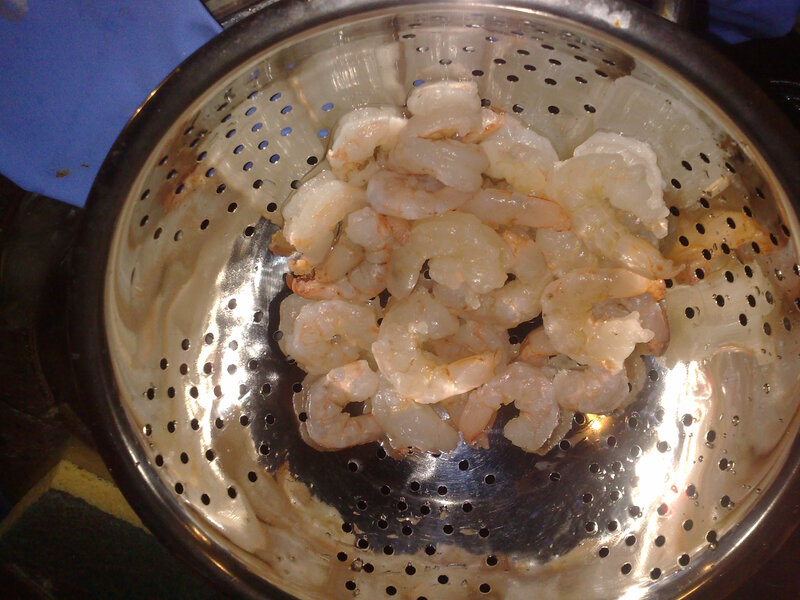 Continue the process with the stock, again adding a half cup at a time until all the liquid is absorbed. Do not be tempted to pour all the liquid at once! This entry was posted in fish, rice and tagged fish. Bookmark the permalink. Carnaroli is actually supposed to be superior, and is more often used by Italians. but Arborio is fine too 🙂 There’s another one I’ve never tried called Vialone Nano or something.